I had a devil of a time getting an Optrex F-51852 128x64 graphical display to initialize properly, so I'm posting the working code here in case anyone else runs into the same problems I did. Optrex doesn't recommend using the internal charge pumps to create the LCD drive voltages for the NJU6676 controller. I am posting two different connections/methods of driving this display. The code is clearly commented as to which h/w layout each pertains to. For what it's worth, I've seen 'reference' designs that use 0.1 to 4.7 uF capacitors, so size doesn't seem to be an issue. NOTE: Allow for a 100 millisecond delay after the PIC powers up before attempting the LCD init routine. This post is fairly old I know, however I'm currently having problems getting one of these to work. I've tried your initialisation sequence and it doesn't work for me. What I had already was quite similar... although the order was different. I'm using a 3.3V supply and Method 1. You said you had trouble getting it to work... what was the actual trick, ie what was it that you changed for it to work? The order of initialisation? The settings themselves? I notice that in the Method 1 code you initialise the Column and Row addresses before you initialise any of the control registers.. yet you don't do this in the Method 2 code... is this intentional? The various datasheets I've looked at suggest that power sequencing is important.. your schematic doesn't show any control over the -10V supply.. did you have any problems with this? 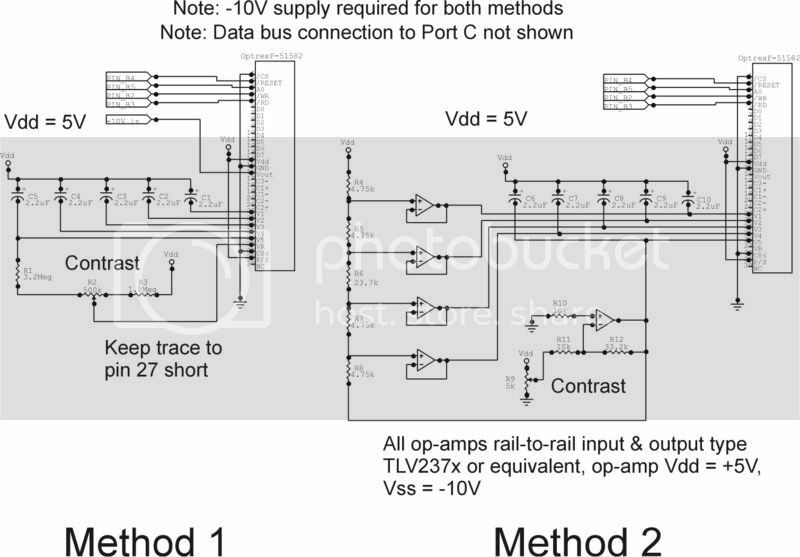 My system uses a 5V supply and method 1. The trouble I was having was that the NJU6676 was supposed to be a direct pin-for-pin replacement for the Epson SED controller on earlier versions of this display (Optrex F-51320, and another F-5something display). It isn't. Not even close. At least the Epson controller's internal charge pump actually works. The NJU6676's doesn't. The problem I had was a) connection and external Vref drive and b) s/w init of the display. Once I stumbled upon an init sequence that worked for me, I locked it in. The original post is the result. The non-initialization of the column & row addresses in method 2 was based on some sample code (in assembly) that I got from an Optrex support engineer. Method 1's code was based on that sample code too. Power sequencing: I remember worrying about this, but my end circuit worked without actually having to do it. My power circuitry is very straightforward. Just direct connections to 5V Vcc and I generate -10V with a pair of TI TPS6040 charge pumps. The circuit I use is directly from the datasheet, http://focus.ti.com/lit/ds/symlink/tps60400.pdf. It's Figure 28, the doubling inverter, found on page 16. Perhaps the inverter takes some time after the 5V rail has come up to establish itself. That said, I didn't have any problems getting the display to work when I was just using a lab supply to generate -10V and I didn't need to apply/bring up the supplies in any particular order. At 3.3V perhaps power sequencing is more important. Try it and see if it helps. If not, get in contact with Optrex for help. Just remember that the US has their 4th of July holiday coming up quickly. I discovered last night that the bulk of my problems were due to (my own!) dodgy soldering on the FPC connector.. so I have progress and an image on the screen... albeit almost invisible, so I have some work to do on the contrast settings. Thanks for the tip on the charge pumps.. will have a look at those.